Kevin Moran a centre-half from Dublin was born on 29 April 1956. He played GAA football at the highest level and won two All Ireland Championship winners medals in the 1970's with Dublin. He was also an accomplished soccer player and played for his college (UCD) team Pegasus FC. Moran had a high profile through his GAA exploits however it was while playing for Pegasus that his soccer skills came to the attention of the famous Manchester United football scout, Billy Behan. The then Manchester United manager, Dave Sexton, signed Kevin Moran to Manchester United in 1978. 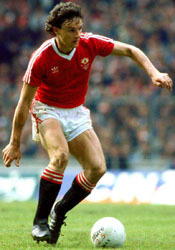 Kevin Moran made his Manchester United debut on 30 April 1979 against Southampton at the Dell. It was a League match and the final score was 1-1. Moran went on to make 289 appearances for United and he scored a total of 24 goals. Kevin Moran scored his first goal for Man Utd on 1 November 1979 when he scored the opening goal in a 5-0 rout of Norwich City at Old Trafford. He had a purple patch in terms of goals during the four seasons from 1981/82 to 1984/5 when his goals per season were 7 - 5 - 7 - 4. A total of 23 goals in four seasons. Not bad from a defender. Kevin Moran's last goal for Manchester United was on 13 May 1985 in a 5-1 drubbing by Watford at Vicarage Road. His last start for United was on 5 March 1988 in a 1-0 loss to Norwich City at Carrow Road. Kevin Moran won two FA Cup winners medals with Manchester United. His first FA Cup final was in 1983 when United met Brighton & Hove Albion. Following a 2-2 draw after extra time, in which fellow-Irishman Frank Stapleton scored one of the United goals, the final went to a replay. The replay, once again at Wembley, was more straightforward for United as they won 4-0 with Northern Irishman Norman Whiteside notching the second goal. Moran won his second FA Cup medal in 1985 in controversial circumstances playing against Everton. Known as a tough and uncompromising defender he was never regarded as a dirty player. In fact on many occasions he came out of tackles bloodied himself. Nevertheless Kevin Moran was the the first footballer to be sent off in an FA Cup final. Everton captain Peter Reid looked to be clear through on goal when in, what looked to be,a clumsy challenge Moran clipped Reid's heels thus halting the Evertonian's progress. Referee Peter Willis did not hesitate to brandish the red card to Moran in the 78th minute. The distraught Moran had to be ushered off the pitch by his own team mates. The score was 0-0 at the time and United held out until the fulltime whistle and actually snatched the winner with just 10 minutes remaining in extra time. Moran collected a winners medal largely courtesy of the other two Irishmen in the team that day. Norman Whiteside scored an exquisite winning goal and Paul McGrath put in one of those performances where he became a magnet for the ball. Every Everton attack seemed to founder on a McGrath intervention has he put in a man-of-the-match performance. When Alex Ferguson assumed control at Old Trafford Kevin Moran's position in the Reds defence was secure but gradually he fell out of favour and his appearances became sporadic. With the writing on the wall Kevin Moran was left Manchester United in 1988 to join Sport Gijon in Spain. Kevin Moran made his debut for the Republic of Ireland on 30 April 1980 in a friendly match against Switzerland. Ireland won the match 2-0 at Lansdowne Road (now Aviva Stadium). He made his first competitive start under Eoin Hand in a 1982 World Cup qualifier in home 1-1 draw with Belgium. Moran was an integral part of the Jack Charlton squad that made the historic breakthrough when Ireland qualified for a first major football championship finals. Moran was at the heart of the Irish defence when the Republic took on England in their opening match in the Euro 88 finals. Through an early Ray Houghton goal and a monumental rearguard action Moran was a major part of an historic 1-0 victory over a strong English team. Kevin Moran also played in the 1990 World Cup finals in Italy and, although he didn't play, he was also in the 1994 World Cup squad in the USA. He played his last match for Ireland on 24 May 1994 in a friendly against Bolivia at Lansdowne Road. Kevin Moran player for Ireland 71 times and scored six goals for his country.